Prerequisite: open to all skill levels with KNOWLEDGE OF RIGHT-ANGLE WEAVE. 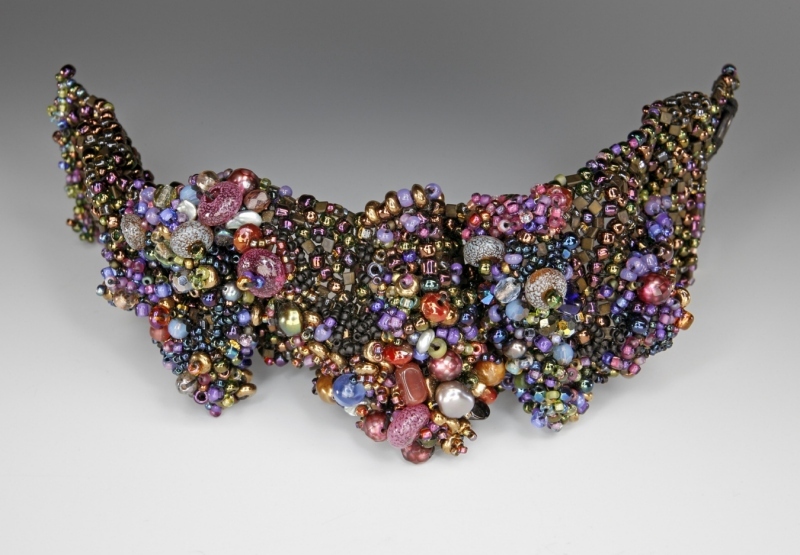 NanC Meinhardt passes on to you her most successful bracelet creation, a piece which has been exhibited at the Museum of Art and Design in New York. You bring to this workshop a 16” by 1-½ to 2” completed strip of right angle weave and then spend the day sculpting, folding, scrunching and shaping this strip into a cuff style bracelet that is encrusted with your favorite assortment of embellishment beads and pearls. The finished bracelet is a sophisticated knockout piece certain to capture everyone’s attention. The cuff is fit to size and held securely around your wrist without a visible closure. Don’t miss this popular workshop. Bring to the workshop a completed strip of right angle weave that is 16” long and 1-½” to 2” wide. Use a double thread and size 8 seed beads to make the strip. You may use a mix of colors and a variety of shapes of size 8 seed beads. For example, use a mixture of size 8 round, size 8 triangles, three cuts, etc. The strip should be in relatively neutral or metallic colors. I know that 16” sounds excessive for a bracelet, but the length is needed to create the Museum Bracelet. You must bring to class a finished strip of beadwork that is 16” long and 1-½” to 2” wide. Make this piece using RIGHT ANGLE WEAVE with one bead on each side of each square. I SUGGEST BEADING THE STRIP ACROSS THE WIDTH (1-1/2” TO 2”) RATHER THAN DOWN THE LENGTH. You may use a combination of bead sizes (8 and 11 seed beads with or without triangles added to the mix) or you can use all one size of bead. You may also use different colors in this strip if you wish. Keep in mind that this strip will be a background for the work you will be doing in class so choose colors that won’t compete for attention. The work you will be doing in class will be intuitive in nature so bring a selection of beads with you that provides lots of options. ALL BEADS YOU BRING SHOULD COORDINATE WITH YOUR STRIP OF BEADWORK! Beads to embellish your bracelet up to 6mm in size. Some ideas would be crystals, fresh water pearls, fire polish, teardrops, lentils, daggers, semi-precious, or anything you desire. I know this is a rather open supply list. If a bead attracts your attention, bring it with you. Bring lots of options to class: the more the better.